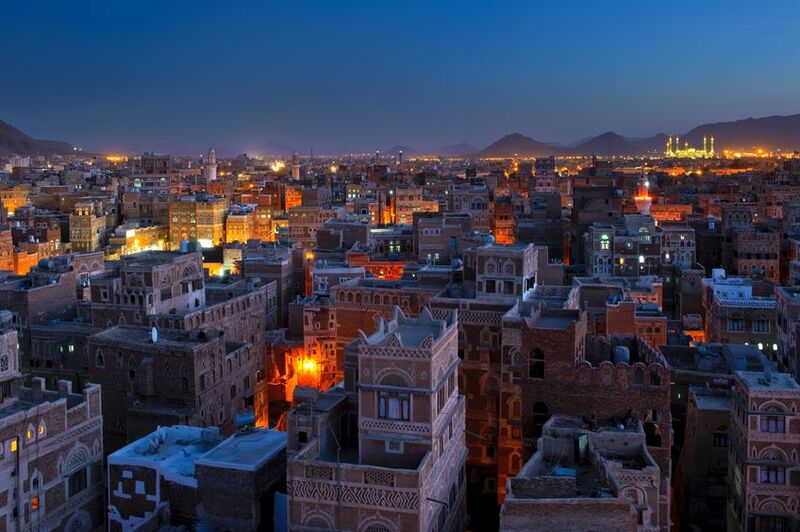 Yemen is one of the most romantic and mysterious countries in the world, and Sana’a is the jewel at the centre. The city is set in the highlands of western Yemen, surrounded by mountains and about 200 miles north of the port of Aden. To the north and east of Sana’a is the “empty quarter” of Saudi Arabia, which is mostly desert. If you head west, you get to the Red Sea. In days gone by, Yemen was an important producer of rare spices, especially frankincense and myrrh which are harvested from slow-growing trees. It exported them along the Red Sea to ancient Egypt, to India across the Indian Ocean, and by camel north, to Jerusalem and the Mediterranean. The ships that sailed to India came back to the port of Aden, laden with precious articles from the Far East. There they would unload their cargoes onto camel trains which headed up to Sana’a, through the Empty Quarter to Jerusalem and beyond. It took 40 days to get to Jerusalem across the desert. If you visit Sana’a, you should try to stay in the Old City. We stayed in a wonderful guest house called Felix Arabia (Happy Arabia) which is several Yemen family homes put together. You can stay there and get some sense of what life in a Yemen house is like. Small boys will volunteer to take your suitcases up to your room, up the high, steep steps. It is best to let them! You may or may not agree that “prayer is better than sleep” but it is an unforgettable experience. The Old City is a World Heritage site, and for good reason. The city is at least 2,500 years old. According to popular legend, it was founded by Shem, the son of Noah. 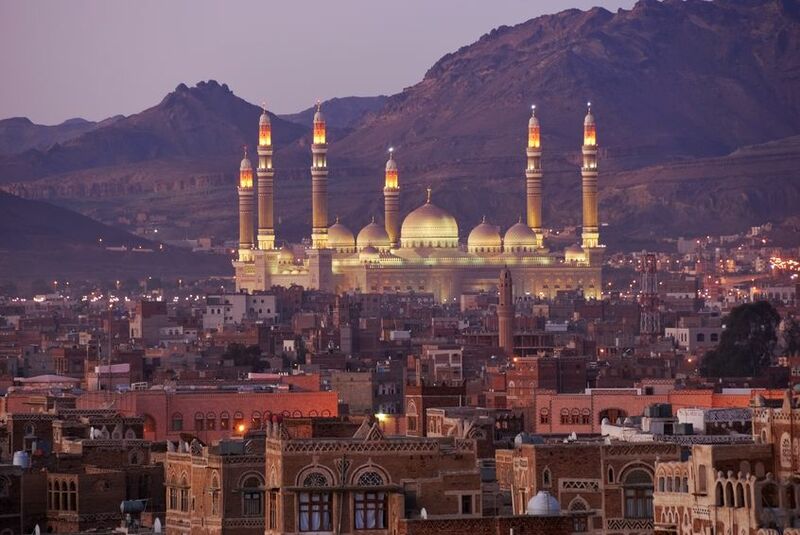 It has 100 mosques, surrounded by the extraordinary Yemeni family buildings that look like miniature brown skyscrapers. The early Christians were active here, and a large cathedral was built, but not much is known about it because – being close to Mecca and Medina – it became an important centre for Islam and the Great Mosque of Sana’a was built c. 700AD using the materials from the cathedral and a palace. You can see it still standing today with its huge minarets. You will be shown stones in the wall with crosses which are said to come from the cathedral. It’s amazing to think that this ancient building was itself built from the stones of a previous Christian building which was itself many centuries old when it was pulled down and re-used. An even larger modern mosque was built in 2008, the Saleh Mosque, which is a beautiful building, especially at night. The most distinctive feature of the Yemen landscape, both in Sana’a and across the interior of the country are the tower houses. There are 6,500 of them in the Old City. These tall, thin buildings, built from mud bricks and beautifully decorated with white stones and glass, are typically the home of a single extended family, and they are laid out inside in a standard way. The top floor is the mafraj. This is an airy room with coloured windows on all sides. This room is reserved for the men of the family. Here they come in the heat of the day and chew qat. In the evening, the city glows with coloured lights like so many Chinese lanterns. These are the illuminated windows of the mafraj. Below the mafraj is the family room, and below that the dining room and below that the quarters for women and children. There are staircases which run up the side of these buildings. The steps are big and very steep, and must keep the family fit. 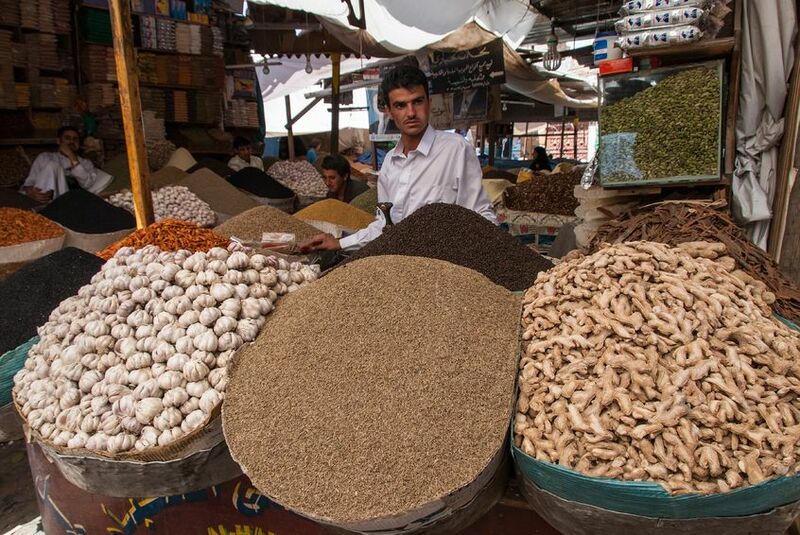 Visiting the souks of Old Sana’a is a must. There are 10 such markets including cloth, cattle, brassware, silver and Salt. The Salt market is a wonderful place; you can buy not only salt but spices of all kinds, piled in great heaps and smelling exotic. The Persian family in Trading Down have a stall at the Salt Market. They are a proud people, strongly tribal and very tough. 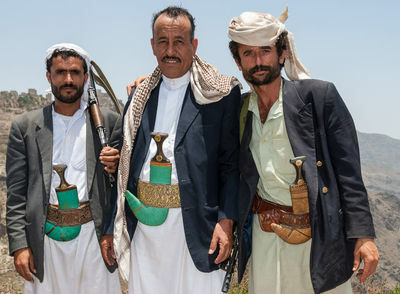 Yemeni men dress in Arab dress, with a long, flowing thawb, or a simple tunic with trousers. It can be very cold, and most men will wear a woollen jacket and a headscarf. Many of them look quite threatening like these three with their large, curved dagger slung from a large leather belt. As you walk the streets in the afternoon, you will see men and boys sitting on the side of the road, chewing leaves. This is qat. Qat is the ruin of Yemen. It is a bush which is grown all over the country and a lot of precious water is consumed in growing it. Everyday, thousands of qat trees are torn down and brought into the city and sold by roadside vendors. You can go and choose the tastiest shoots yourself. To consume it, you chew on the leaf, making it into a ball which you keep inside your cheek. A mildly intoxicating substance is released into your saliva by chewing, and gives you a mild lift. Qat is addictive and when we were there, about 90% of men and 40% of women are addicted to it. Most of the women you will see in Sana’a will be wearing black, and some form of veil. 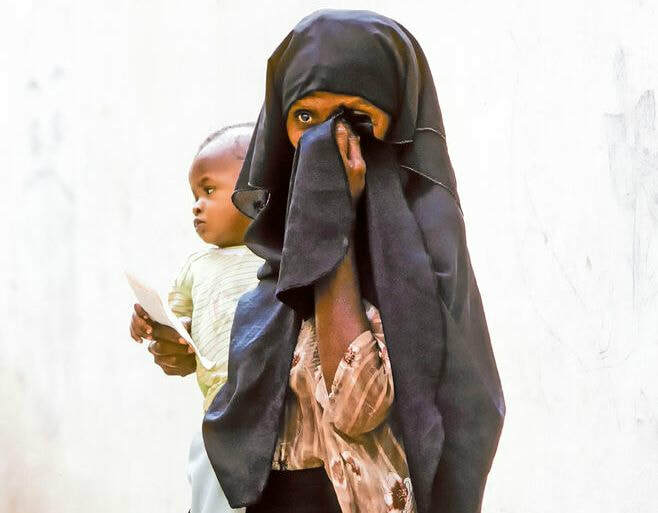 The married women will tend to conceal their eyes behind the veil. There is a special form of burkah worn in Yemen, but it is not typically worn in Sana’a. Most women will wear the less restrictive niqab. As you walk behind them, look closely! You will often get a glimpse of sandals and blue jeans underneath. My daughter, who stayed in Sana’a to learn Arabic, used to go to the hospital once a week to teach English. It was hard for the nurses and female doctors to learn English because the English teachers were mostly men and they were not allowed to mix with them. ​Romantic and mysterious though it is, Sana’a is not a place to visit today. It is at the heart of a brutal civil war. It has been bombed and the water and electricity supplies cut off. Cholera is raging through Yemen, and a large scale famine is threatened. I hope that one day it is once again a place for people to discover and enjoy.